Bangladesh is a maritime country with 710 KM of coastline at the vertex of the Bay of Bengal. It has two major seaports largest and busiest one is in Chittagong and the other port is in Mongla at Khulna. The admiralty court is located in the High Court in Dhaka. All maritime and admiralty related claims and proceedings are brought before the Admiralty court. Due to several factors like weather conditions, condition at the port, navigation error, pilotage etc collision does occur and such cases are not very uncommon in Admiralty court. Similarly, ownership disputes for local seagoing and non-sea going vessels are required to be brought before this court and the same are a regular item of this court. Foreign and local bunker suppliers, crews and mortgagee banks often invoke this jurisdiction for recovering their dues by arresting the vessels lying in Bangladesh territory. Involvement of International P&I Clubs and local and foreign Banks are a common affair as without their undertaking or bank guarantee respectively, the release of the ship cannot be insured. Claims arising from the carriage of goods, Shortfall of Cargo, Cargo damage, dead freight failure to pay freight and hire etc are nowadays common item as litigants are now more concerned with their rights. Action in rem for charter party claim for sub-freight on cargo lien can also be brought in limited cases depending on the arbitration clause. Our Chambers is one of the leading law firms in this area of law and has long experience of dealing with almost every kind of litigation which is brought before the Admiralty court of Dhaka. 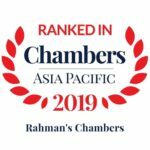 Rahman’s Chambers has been ranked as a “Spotlight Law Firm” for “Shipping” by Chambers and Partners, 2019. “Rahman’s Chambers handles finance and shipping. Work highlights included…. assisting London P&I Club with a collision that took place in the port of Chittagong. Rahman‟s Chambers is one of the leading law firms in the area of Admiralty and maritime. The Firm for a decade successfully handling claims for local and foreign clients on different issues like bunker claim, collision, mortgage and charge claim, claim for freight, lien, sub-freight of ship-owner, charterers, salary and wages of the crew, seaman, disputes involving cargo damage and ship cargo ownership disputes etc. The firm represented carrier, shipper, bank, seaman and manager, P & I Club and also ship-owner with a very high success rate. We have successfully represented a leading P & I Club and the owner of MV Evolution in a complex dispute involving damage of bulk cargo in Chattogram (previously Chittagong) outer encourage. There were complex issues involving the liability of master in cargo damage, rules & regulation on dumping of damaged cargo, which lead to a significant delay in discharging and release of the vessel. While suits filed by both parties were pending, we were able to reach a settlement, which ensured full discharge of cargo and release of the vessel within shortest possible time. We have successfully resolved the dispute out of court on a multiple collision matters at Chattogram anchorage securing ship owner’s interest on behalf of leading P & I Club for the vessel M.V. MIM SUPRAMAX VIVI. A very first suit for limitation of liability has also been filed by our firm under the coverage of P&I Club in this matter. While suits filed by both parties were pending for trial, we successfully settled the matter with the other side out of court protecting client‟s best interest. We have advised client over Charter-party claim pending in LMAA arising from claim over sub freight involving the discharge of cargo in Mongla port. We have also advised Piraeus based shipping company along with the concerned P & I Club and owner of M. V. GRIGORIY SHELINKOV over a charter-party dispute arising owing to demurrage and damages for detention. We acted for the owner of MV GLOBAL HARMONY, in a complex dispute involving a claim of lien over cargo for failure to pay freight. We were finally able to settle the matter out of the court successfully and assisted the concerned P & I Club. Successfully recovered dues and interest for Marodi Services S.A.S, Italy and Ocean Energy Limited, Monaco for the supply of Bunker to M.V. SWIFT CRO and MT MEGACORE HONAMI respectfully. Successfully filed admiralty suit for Seramontt Limited, UK against M.V. DahiatulKalbi for recovery of loss of cargo and acted for Achates Shipping Corp., Greece, owner of M. V. KOUROUPI in relation to a cargo dispute. Successfully settled collision claim for a leading P & I Club and Sea Satin Oceanway S.A. of Liberia and MV Marina R against MV FRANBO WIND and others. Successfully filed admiralty suit for Integr8 Fuels Inc, U.K. for breach of terms for the supply of Bunker quality against the local supplier. Successfully released a Marshall Island flagged vessel from detention through court order for owners and a leading P&I Club in a sensational collision incident with frigates of Bangladesh Navy, naval berth by submitting local Bank guarantee. The release was challenging as it was completed in and around the national holiday period, while the court was on vacation. A limitation of liability suit has also been filed by our firm under the coverage of P&I Club. We acted for Bunge S.A., Switzerland, disponent owner of M. V. SUPRASTAR over dispute involving freight, hire and discharge of cargo resulted in filing of number of admiralty suits in Bangladesh and the same was settled as so far admiralty suit is involved unless it is allowed to discharge the cargo and sail from territorial water of Bangladesh. Successfully pleaded for protection of the jurisdiction of the Admiralty court as opposed to specialized tribunals for loan recovery cases filed for Banks for ship finance and mortgage in the landmark decision reported in 69 DLR (2017) 408 and also advised Kuwait Finance House Malaysia BHD, May Bank Malaysia over disputes involving trade finance which led to filing of admiralty suit in Bangladesh. Successfully filed a co-ownership claim for First Security Islami Bank Limited against the respective local owner. Successfully filed case for Komrowski Maritime, Germany in a shipbuilding dispute against local shipyard for recovery of dues against supplies. Successfully advised Cosco Shipping and assisted in releasing vessel M.V. LE TAI in agency dues related claim. Successfully recovered claims for due salary, wages and service fees for Sea Power Shipping Enterprises. Inc., a Ship-Manning company against MV LORD. We acted on behalf of Master of the vessel M. V. OCEAN RICH jointly with Polaw & Co, a law firm based in Shanghai on issues involving marine supply contract and successfully assisted the Master to release the vessel through negotiation. The chambers successfully brought a case for the major UK based global seller/shipper of food grain in recovering dues against carrier/ship owner by filing Admiralty suits for cargo damage caused due to deviation & delay. We represent a major global supplier of Vegetable oil from Malaysia in a dispute arising out of cargo shortfall in Bangladesh in a suit filed by the consignee. We have advised a Malaysian finance company over disputes involving payment under a letter of credit by local L/C opening Bank involving fraudulent transaction having an impact on consignee as to its roles & responsibility in a suit filed in the admiralty court. Assisting OOCL for recovering freight and charges related dues from a local shipper. Ship arrest is a common remedy available to compel recovery in majority suits filed in the admiralty court. The admiralty law, unlike other civil law matters, allows the arrest of the ship where the plaintiff has a maritime lien or the right is enforceable as action in rem. Legal service is imperative for arresting vessels through court order on behalf of ship-owner, co-owner for ownership disputes, despondent owner, shipper, charterer, banks, bunker & other suppliers etc. Legal assistance is of paramount importance for major bunkers and other suppliers and also global sourcing companies in the recovery of dues or loss and damages arising from breach of supply contract while sourcing locally. Recovery of dues involves enforcing the maritime lien or by filing an action in rem case while the vessel is in the territorial water of Bangladesh. The work often involves taking speedy actions as vessel often leave anytime. Relentless support is required in assisting Marshall of the Hon‟ble court in securing ship arrest as the vessel in question often leaves at the soonest possible time. 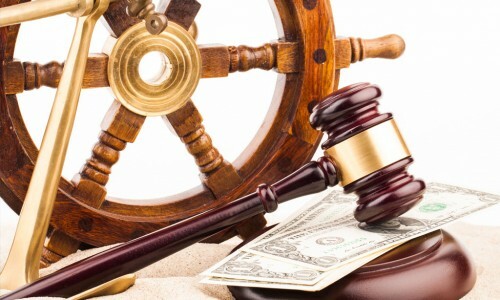 Legal assistance is necessary for disputes involving ship mortgage, ship finance, L/C related fraudulent transaction, etc, on which the firm has gathered its experience and expertise. Legal service is essential over co-ownership disputes involving possession, earning from vessels, chartering, mortgage etc. Our admiralty law allows maritime lien for co-ownership claims. Arresting vessel to enforce claim over co-ownership disputes is not unusual. Legal advice and taking the requisite legal advice timely is of the essence on issues related to collision matters. We have specialized team, knowledge, experience and ability to deal with all sorts of collision matters and to take the requisite steps, e.g. ship arrest, the release of the vessel from detention etc, expeditiously taking into account urgency of the matter. The chambers possess significant experience of dealing with disputes accruing from the carriage of cargo which involves a multifaceted arrangement of shippers, freight forwards, local agents, banks, carriers, insurers, receivers and others. Legal assistance is vital over disputes involving loss of cargo, damage of cargo, a shortfall of cargo, demand for compensation, contractual obligations etc. The Chambers have previous experience of working for foreign ship manager and supplier of crew and were able to successfully recover the wages, fees etc. Legal assistance is important over disputes involving claims of seamen regarding salary, wages etc. The chambers hold noteworthy experience of dealing with several complex claims deriving from charter party claim for hire, B/L claim for freight, demurrage and detention claim. Charter party hire related disputes mostly require being resolved through arbitration as stated in most of the charter party. In exceptional cases, charter party hire related disputes might be suitable for enforcing action in rem by filing admiralty suit in the Bangladesh territory as a mean of recovery of claim which allows the arrest of the ship in question. Legal service is of significant importance over disputes involving charterparty hire, recovery of freight and charges accruing from demurrage, detention, dead freight against shipper/cargo owner/local shipper/charterer and consignee/buyer. The exercise of lien is also subject to local law related issues. Hence, due diligence report is vital to deal with any such dispute. Sea Power Shipping Enterprise Inc.
Maersk Bangladesh Limited vs Bangladesh reported in 4CLC(HCD)79. Article: Laws related to Maritime Lien & Maritime Claims in Bangladesh (Vol. 1 of 2012).